Five years of dreaming, 4 engineers, 1 year of research, and 70 prototypes led us to a custom dripper and filter that will improve home coffee brewing. There are many drippers out there, but we knew we could do better. So we teamed up with scientists and engineers to create an entirely new dripper system that tells the coffee where and how to flow for the most delicious pour-over coffee imaginable. Pour-over coffee is reminiscent of coffee from a drip coffeemaker, but noticeably more delicate and complex. Like driving a stick shift, pour-over preparation puts you in control of your coffee—and you'll only get better with practice. 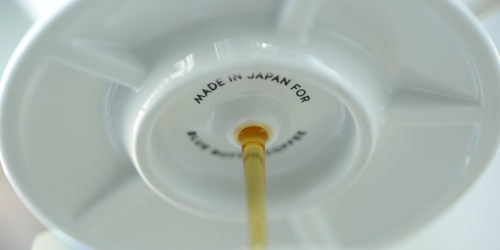 Our Dripper's design ensures that your first cup will be delicious. Your one hundredth? Sublime. Our custom filters (not included) were designed in conjunction with the Dripper. The bamboo-based paper is so finely tuned that the filters require no prewetting and impart no paper-y aftertaste. We refined the pleats and the overall shape of the filters to work harmoniously with the Dripper, so you can have the best coffee possible—at home. 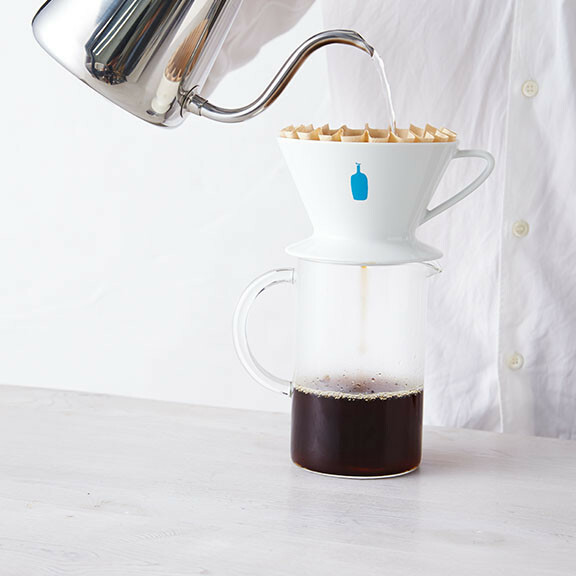 Learn how to make pour-over coffee with the new dripper. Find a brew class near you. Our method is based on the capillary system in nature—like the way a tree moves water from its roots to its leaves. Forty interior ridges (sized smaller in width than a single drop of water) pull the water through the dripper faster than gravity alone could. 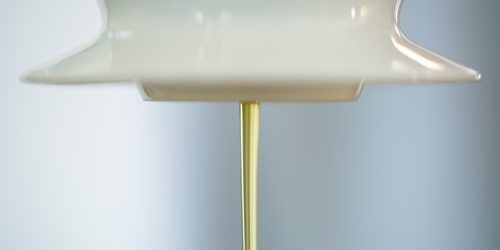 Our dripper is smaller and thinner than most and has a flat bed for even saturation and complete extraction. When your coffee is saturated evenly and extracted fully, it tastes better. The thin porcelain walls of the dripper retain heat effectively, too, so your coffee won’t get cold while you’re making it. 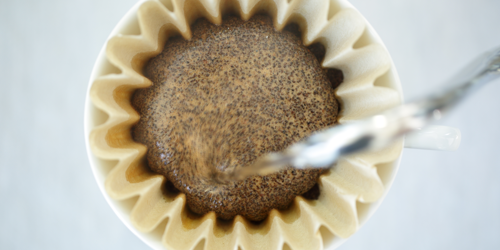 Look closely when pouring—you’ll see a single thread of coffee leaving the dripper. Our precision nozzle, sized at 4.45 mm, enables an ideal flow from dripper to cup. Too restrictive a flow, and the coffee would be muddled. Too open, and the performance would be unpredictable. Many say that Japanese ceramics began in the town of Arita. Today, the family-owned Kyuemon Factory carries on the tradition and craft of carefully rendered, handmade ceramics. 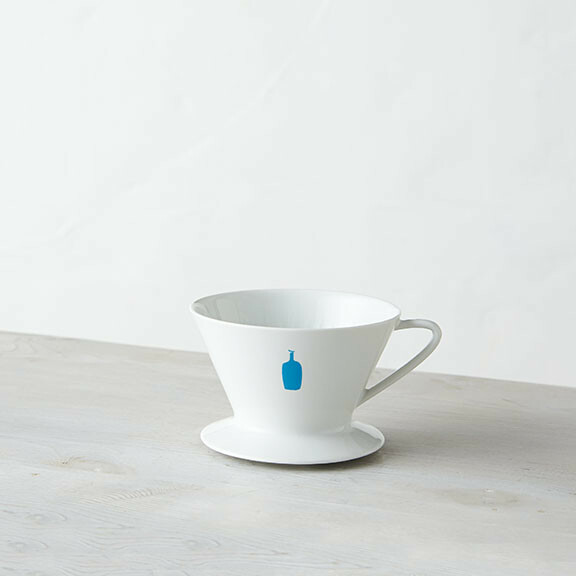 We entrusted the factory with production of the Blue Bottle Coffee Dripper. 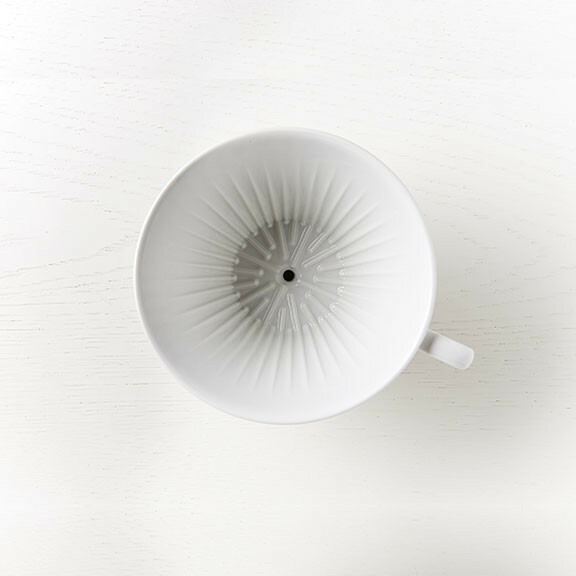 Each dripper is fired at high temperatures over many hours to produce a lightweight ceramic that retains heat evenly and is exceptionally strong. 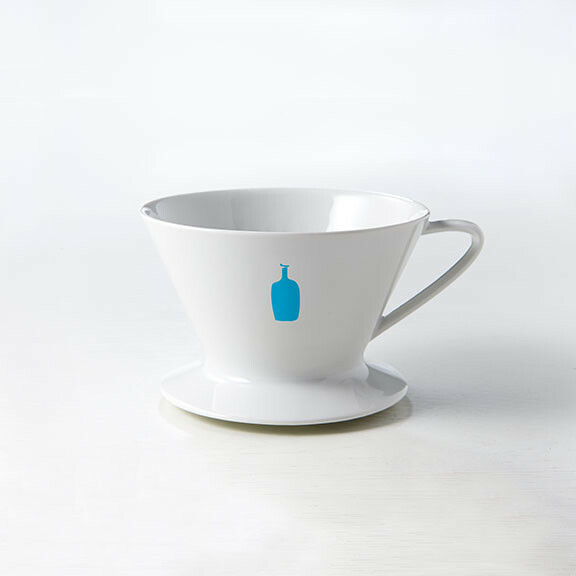 Blue Bottle Coffee Dripper extracts more beauty and deliciousness from your coffee. The flavors taste more layered; the profile is more articulated. Whatever coffee you choose to brew, you will notice startling clarity.